The HyperX Pulsefire FPS Pro is aimed at those that value performance without the accompanying premium price tag. Priced at under £50 in the UK ($59.99 US / $89.00 AUS) HyperX haven’t skimped on the internals or the sensor. The Pulsefire FPS PRO uses a Pixart 3389 optical sensor, this choice is surprising, as most others tend to use a Pixart 3360. This selection benefits the end user as the 3389 doesn’t use hardware acceleration, which is supposed to provide reliable performance and precision. 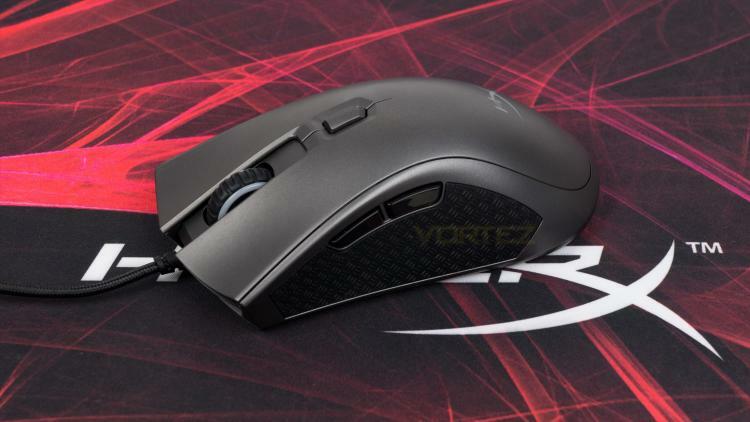 The Pulsefire FPS Pro also utilises a 1000Hz polling rate, Omron switches as well as the other usual suspects such as RGB illumination, software control, an ergonomic design and textured rubberised side grips. The Fury S Speed Edition is available in four different sizes to suit multiple preferences and desk sizes. On hand today we’ll be looking at the largest offering which is the extra large, it also comes in large (450mm x 400mm), medium (360mm x 300mm) and finally small (290mm x 240mm). You can also pick up either the standard edition or a Cloud9 edition if you’re a fan of their eSports team. What is worth noting though is that the standard is optimised for precision whereas the Speed and Cloud9 edition are tailored towards speed, so if you do want a more precise surface, you don’t get a design with all the flourishes. Sizing and surfaces aside the Fury S utilises seamless stitching all around it as well as a rubberised underside.